The world is full of courageous men who risked their lives for a cause. Whether it’s an expedition into the remotest parts of the world, or fighting off the enemy in the most epic war in history, some men have a way of distinguishing themselves. Indeed, we tend to admire those who have stared death right in the face and gritted their teeth, never to back down. We long to be like them in some small measure and we read their stories, hoping to glean some insight into how they did what they did. One such man is Ernest Shackleton. What did he do? If you haven’t heard the story of The Endurance, you need to know about it. It was the year 1914, and the popular notion of conquering the Antarctic continent was alive and well. Ernest Shackleton had put together an expedition. 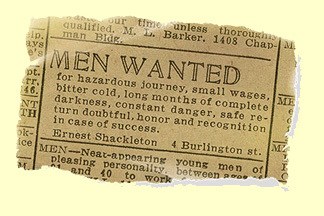 He placed an ad in the paper promising death, darkness, poor wages, constant danger and honor as a reward if successful. Historians tell us that The Endurance was built for loose ice floes, and was extremely strong. However, it was not a bowl-bottomed boat (which would be squeezed up out of ice packs that closed in). This proved to be a mistake, as the ship became caught in impenetrable ice in early 1915. Shackleton decided to try and wait it out, but by November of that year, it was clear that the ship was lost. The crew was forced to abandon the vessel and face the harsh prospects of survival on the ice floes. What was left of the Endurance after the ice was finished with it. Imagine that you have to leave your ship and live on a block of ice, with nothing but seal meat for food…for two years. That’s right, the crew of Endurance was stranded for more than 24 months. Furthermore, in almost every shipwreck story in history, casualties are high, morale is low, and the outcome is usually disastrous. It’s the norm for shipwrecks to boast a tremendous loss of life. But not Shackleton. He managed to lead his men through two years of life on the ice against incredible odds, until eventual rescue. And not a single soul was lost. There are lots of lessons to be learned about leadership and endurance from this story. Ernest Shackleton is one of the few men in history to have faced death like he did, and he had a courage that is incomprehensible. It also tells us a lot about resilience, and facing reality head on. These men had to fight to survive the elements, low morale, mental fatigue, and a fiercely unforgiving ocean. But they came through it all. They had to come up with some creative ways to keep from going crazy, including writing in their journals about their experiences and singing songs to keep their spirits up. They had to fight to see their situation in a positive perspective, and while I don’t know about Shackleton himself, I’m sure that there were a lot of times on that voyage that those men cried out to God. They had to have resilience, and understand that getting out of that situation was going to be very, very difficult. But they did it. Oh by the way, how exactly did that rescue go down? Well, after months on the ice, the crew eventually got to Elephant Island (which is basically a couple giant rocks sticking out of the ocean near Antarctica. Very little native vegetation or wildlife to speak of.) They survived by hunting seals and penguins, and soon, after realizing that they would not last long, Shackleton made the courageous decision to seek rescue. The nearest inhabited land was over 800 miles away, and the only way to get there was in a tiny little boat, with no modern navigation equipment, across treacherous oceans and perilous seas. And he did it. It’s still considered among the most incredible nautical feats in the history of the world. See? Not even Google can do it. But Shackleton did. Eventually, he got to South Georgia island, where there was a small whaling station. Oh, and did I mention the only inhabitants were on the opposite side of the island? Across a mountain range? In the middle of winter? So not only did he have to sail 800 miles to a little rock with a whaling station, he then had to cross the mountains with the handful of crew mates he brought along, and do it quickly before they ran out of food or froze to death. But he succeeded. He got help, and sailed back to Elephant Island to the men he had left there. He found them in 1916, and they had survived. Of the original crew of 28, a crew of 28 awaited him. Not one casualty throughout the whole ordeal. And it was all because of Shackleton’s unparalleled leadership in making the right choices at the right time (and God’s grace, of course). So what can we learn from this about resilience? Don’t give up. There were so many times that those men wanted to give up but they didn’t and it paid off. Keep going. This story truly is incredible. I highly recommend reading the book.